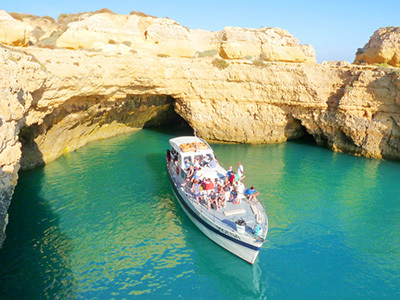 Seafaris takes you on the best Algarve cruises experience! 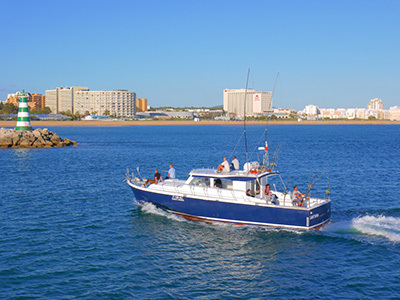 Operating from Vilamoura Marina , Algarve Seafaris Cruises is a duly licensed company and a pioneer in the Cruise / Fishing activity on the Algarvian coast. We explore the very best the Algarve has to offer, stunning rock formations, cliffs, and some of the largest caves and tunnels in Europe. We have various cruise programs including, a half-day cruise and visit inside the caves, or a full day cruise with a break on a secluded beach only accessible by sea, where we present you with a mouthwatering BBQ lunch service. There are even programs for sport fishing, including deep sea fishing and a family fishing trip, we provide you with all equipment and bait. We offer two types of fishing, deep sea fishing for smaller types of fish and big game fishing for large species like the Blue Shark, Swordfish, Tuna, Dorado and others. 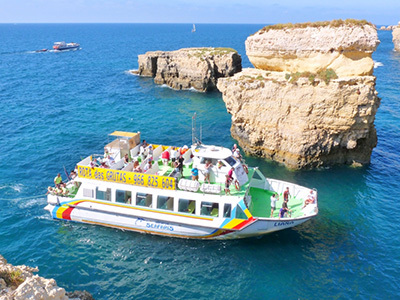 Take a cruise on the biggest Catamaran currently cruising the Algarve's coast, at 19m long and a capacity for 140 passengers! Maybe you prefer a yacht, then try our cruise aboard an 18.5m with a capacity for 60 passengers Then there's the baby of the family at 13.5m and capacity for 20 passengers our specially constructed yacht for fishing shark and swordfish is no small fry. All our cruises begin in Vilamoura Marina, sailing west along the Algarvian coast.